Arizona’s Grand Canyon is one of the largest scars on the face of the planet, but despite its fame, how and when it formed is something of a mystery. Depending on whom you ask, the gash of the Grand is either 50 million, 16 million or 6 million years old. Other canyons on Earth are longer and wider (Australia’s Capertee Valley is both) and deeper (Kali Gandaki Gorge in Nepal), but the Grand is famous for its intricate layering, maze-like side canyons, vivid colors and epic visual scale: it’s 277 miles long, up to 18 miles wide and over a mile deep, cutting down through more than 2 billion years of geologic time, exposing some of the oldest rocks on Earth. The main problem with studying the formation of the Grand Canyon is that most of the geologic evidence has been swept away by the mighty Colorado River. Geologists have proposed two main scenarios to explain how the Grand got to be so grand: The first presumes the Grand Canyon was eroded entirely by the Colorado River, starting around 6 million years ago when the river first began running across the Colorado Plateau. 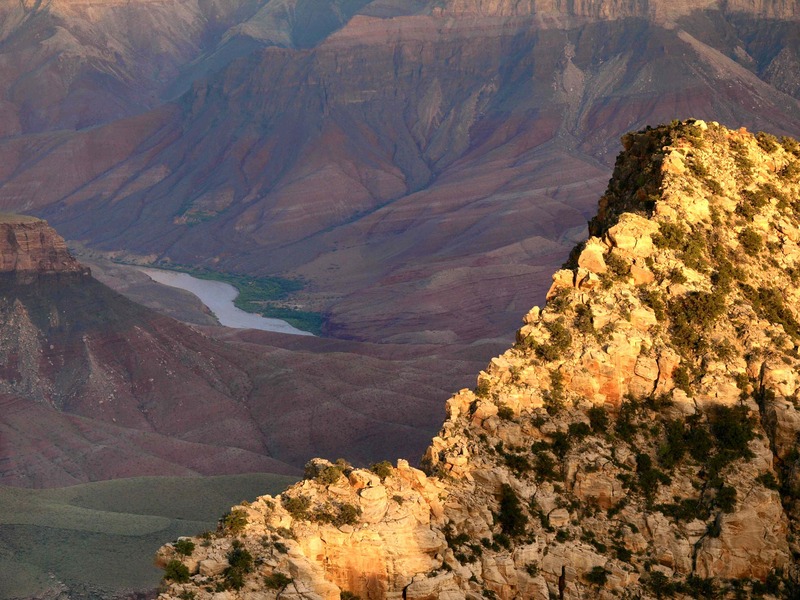 The second calls for a so-called proto-Grand Canyon that may have started forming around 16.5 million years ago that later captured the Colorado River. While the first scenario has been well accepted by geologists for more than 30 years, the second model, which would make the Grand Canyon 10 million years older than previously thought, was proposed to much fanfare in 2008, but is not yet widely accepted. This was my second visit to the North Rim of the Grand and I have not yet been to the South Rim. My first time here was in 2005, right after college, on my first epic road trip from Pennsylvania to Oregon. The Grand was our fulcrum. On long road trips I’ve found it’s a good idea to pick a halfway point where you plan to spend a few days before heading for your final destination. It helps break up planning into more manageable segments and helps ward off destination-fever, that feeling that you need to keep rolling down the road, no matter what you might miss along the way. The last time I was here, incredibly, I didn’t have a camera. Well, I had my mom’s point and shoot film camera, but that doesn’t count. Looking back over those prints, I see some of my photography trademarks: trees in the foreground of wide landscapes, my tendency to photograph people as they look out at the landscape, not into the lens and, of course, my faithful and photogenic dog, Bowie. The Christmas after that first big road trip, I bought myself my first real camera, an Olympus E-300 digital SLR and I’ve seldom been without a camera around my neck since. These days, photography is how I interact with my environment and after snapping more than 60,000 photos (my hard drive is dying) I’ve come to see the world with the eye of an artist, all lines, angles and spirals. I’ll see the South Rim soon enough. 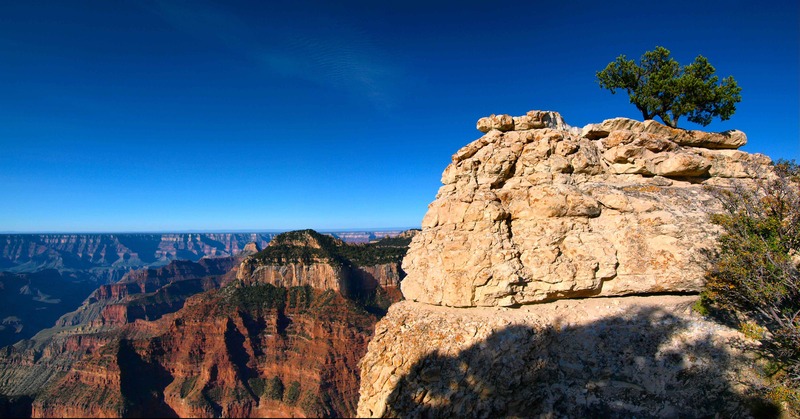 For my 30th birthday in February, I’m planning a backpacking trip into the Grand and since the North Rim is closed in the winter, we’ll be leaving from the South. I can’t wait to get below the rim; both times I’ve been the dogs have been waiting in the car so I’ve been missing out on a good, long hike. Such a tease! No better place I can think of to celebrate three decades than this place, no matter how old it might be. 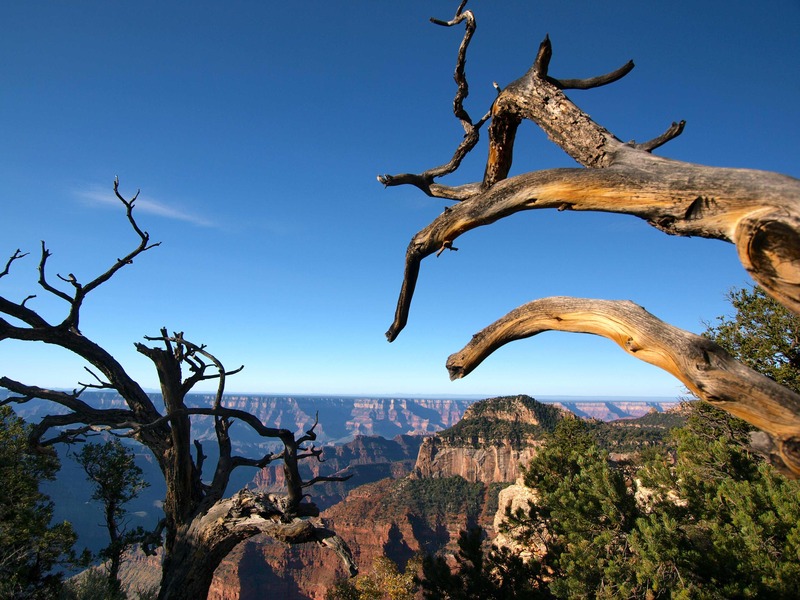 Click here to see more pix of sunset from the North Rim and sunrise from the East Rim and here for shots from Bright Angel Point.